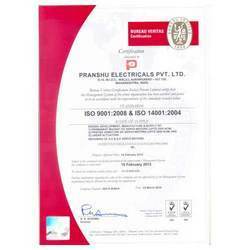 We are an ISO 9001:2008 & ISO 14001:2004 certified organization, engaged in offering unmatched range of electrical DC motors and electro mechanical motors. Efficient use of raw material in manufacturing process has made these motors durable and superior in quality. To ensure that our entire range matches with international quality standards, we have set up a quality testing unit. By conducting these tests, our quality controllers make sure the passage of flawless range of products to clients. It is the relentless efforts of our quality controllers that have enabled us to cater ever growing demands of cable, pharmaceutical and BOPP film industries. In order to attain maximum client satisfaction, we consistently surge towards improvisation of our business operations. We design our range of Electrical DC motors and Electro Mechanical Motors as per the specified ISO standards that helps us in meeting the OEM requirements of our clients. With ethical business policies and transparency in our dealings, we have been successful in garnering multiple clients over the time. We offer a customized motors adhering to the demands and specifications of our valued customers. Further, for complete client satisfaction, we also provide repair work and import substitutes for every type of imported servo motors.